Consider a situation in which you could pay yourself, at no cost to you. Wouldn’t that be wonderful? What if I tell you that there is a currency in which this is possible… but that it is only available to academics? It is my favourite currency of all… citations to my work. Citations are necessary to implement new research into the body of existing literature. But besides that, they are also used as a metric to measure the success of a scientist, and as a way to publicize papers. It is not very surprising, therefore, that it is attractive to cite your own research in your subsequent works – even if it is not directly relevant. Is there a difference then, in what scientists “pay” themselves? A study published in Nature suggests that men cite themselves far more than women do. If that is true, currently important numbers such as the h-index (based entirely on citations) may not be the most fair basis for decisions made on tenure and grant applications. And work by male scientists may gain more notoriety, as it is advertised more. My colleague Graham and I were curious about whether we could replicate the Nature study within our own field . For postdocs, we indeed found a similar relation: postdoctoral men self-cite more than twice as often as their female colleagues . 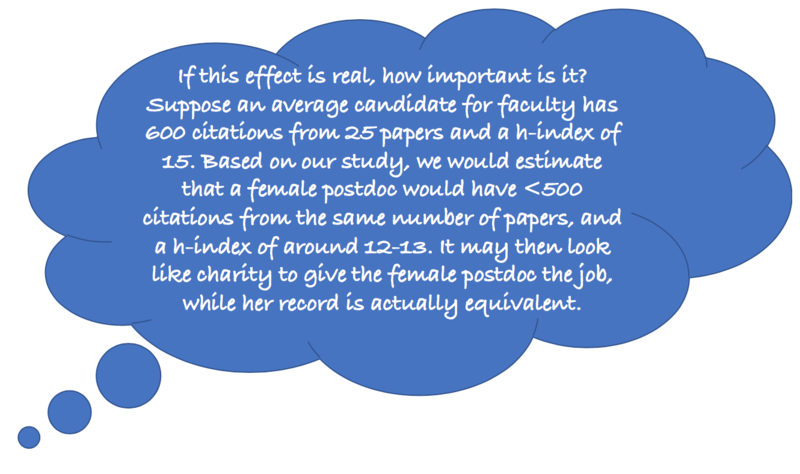 However, the discrepancy seemed to have disappeared at the faculty level: the female faculty we studied self-cited at exactly the same rate as the male faculty (and much more than postdocs) . Is there a survivor bias effect? Our findings may indicate that there is a link between survival and prolific self-citation among female scientists. Does co-publishing with (other) women negatively impact your (self)-citation rate? We found that papers typically have none, or several female co-authors. This may reduce the self-citation rate even further. What is the lesson of this story? Although it is unclear how (self-)citation rates correlate with a successful academic career, metrics such as the h-index may be less than perfect. But if you are wondering if you self-cite too much – you probably do so less than your boss. And if in doubt: a little bit of extra advertising never hurts, especially if you have female co-authors! PS: For other interesting blog posts see [1,2,3,4,5,6,7,8,9,10,11,12,13,14,15,16,17,18,19] ;). The nature article suggests several limitations to their study, for example: women may be hiding their gender on publications (and were therefore left out of the study); the ratio of senior/junior scientists is higher for men; as could be the level of specialization. 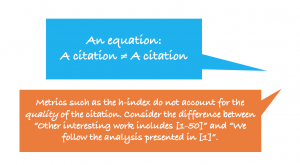 A h-index of 10 means the author has 10 papers with at least 10 citations. We looked at other correlations as well, for example, self-citations and ethnic minorities. However, given the size of the field, it was difficult to get a large enough sample to say anything statistically meaningful. We looked at a random selection of twelve female and twelve male postdocs. We looked at a random selection of ten female and ten male faculty. And it is subject to some of the same limitations as the Nature study, in the first footnote.